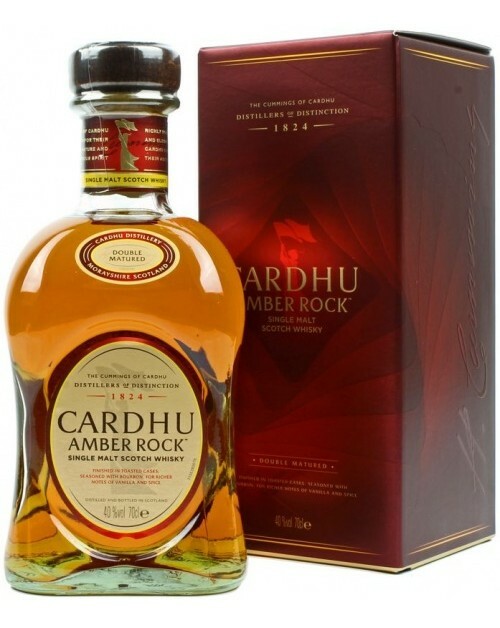 Cardhu Amber Rock Single Malt Whisky is double matured in toasted American oak casks, giving a full bodied whisky. It has vanilla, citrus and oak notes. The name comes partly from the colour of the whisky and partly from the Gaelic meaning of Cardhu, which means 'Black Rock'. Nose: Cinnamoned apples, warm honey and notes of orange zest. Palate: Warm on the palate with lemons, soft caramel and oak notes. Finish: Lingering; gentle orange notes with an oak ending.